I don’t know about you guys but around here I feel like we had the winter that never ended, followed by two weeks of spring then a hop straight into summer! I’m not complaining, because we all know I’m not a fan of cold weather but it was nice for a month or so when we were able to turn off the heat and open the windows of the house to enjoy that beautiful spring weather! (Not to mention the savings on our electric bill from not running the HVAC constantly!) Did you know that heating and cooling make up about half of the average US home energy costs?? Now that temperatures are climbing into the upper 80s and 90s and the hot and humid summer is approaching I wanted to share some easy ways you can save money while cooling your home this summer. Most newer model thermostats allow to you to schedule changes in your thermostat settings for when you’ll be out of the house. If you work outside the home it doesn’t make sense to keep the house as cool while you’re away. Simply adjusting it by 10 degrees when you’re away can save you up to 10% each year. We installed this model of smart thermostat in our last house and it could even be adjusted with our smart phones! Change your air filters monthly and unless you have severe allergies opt for the cheaper filters rather than the HEPA filters-they can strain the HVAC systems and are usually not necessary. I love a bright, sunny house as much as anyone but in warm weather I opt to keep our blinds closed most of the day. Hot summer sun beating through windows can increase the temperature immensely and make cooling your house much more work for your air conditioner-which translates into more money out of your wallet! 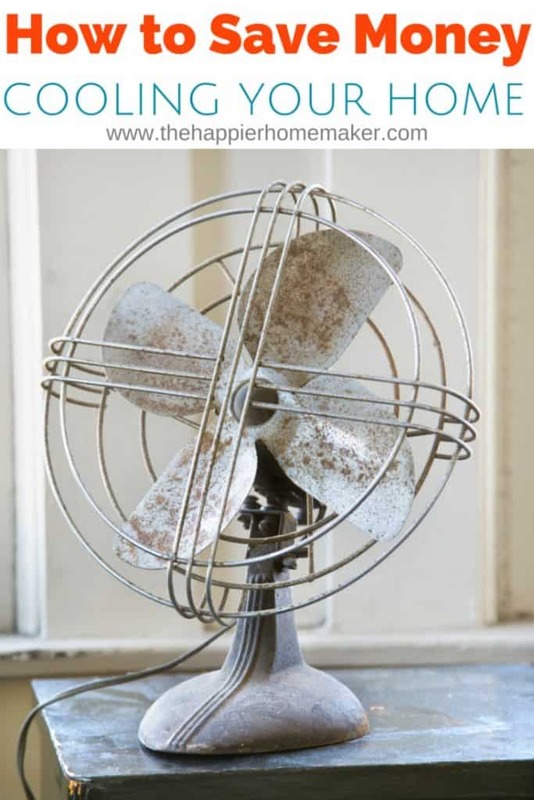 Not only with a breeze from a fan make you feel cooler-it will move the cool air through your home and make your air conditioner cool the home more effectively. Ceiling fans are a great option if available but stand fans can do the job as well! The cost of running a fan is significantly lower than running your cooling system as well! Anyone who’s slaved over an oven-intense meal knows how quickly the oven can heat up the entire kitchen-take advantage of summer weather and move the cooking outside to the grill when possible to avoid heating your home using the oven and stove! By taking these small steps you can reduce your cooling bill and save your hard earned money for more summer fun! Do you have any other tips for lowering cooling costs? Please leave them in the comments! just replacing our vinyl mini blinds for the thick wood ones has helped our electric bill go a little lower. We, and I mean my husband, just taped and sealed all of our duct work in the basement. We now have more air blowing through the vents which has decreased the temp on the 2nd floor. It’s incredible! And I agree, we want went from a bitter winter almost straight into a hot, humid and sticky spring. Awesome tips, Melissa! My husband and I like to lessen our carbon footprint as much as we can. I think it’s important that we’re not leaving our air conditioning system on while we’re gone. I’ll take your advice and change my air filter soon; hopefully that will lower our energy bill! Interesting article. This is a big problem. An air conditioning system consumes a lot of electricity. This can give a negative effect on a total bill. If you do not live in climatic zones with a high temperature (for example, Los Angeles), it is better not to install an air-conditioning system. In summer it will be enough to use a ceiling fan. This will allow you to reduce a cost for electricity. In addition, installation of an air conditioning system and the purchase of air conditioners will be expensive. You can also plant trees or bushes near your windows that will create a shadow. Then in your house will not be so hot. Thanks for the great tips!